Music streaming is changing! The Spotify app for iPhone is a new service for US, UK and European users that gives you restriction free access to search and stream the entire library of songs from Spotify. Spotify is instant, fun and simple and social and has about 15 million tracks in its catalog. Share songs and playlists with friends on the Spotify iPhone app, and even work together on collaborative playlists. Previously only available in the UK, Spotify finally became available to US customers in 2011. Audio Quality – Spotify music is streamed to the iPhone using the Ogg Vorbis q5 codec and there are 3 audio quality levels to choose from for streaming music. Extreme (New): Spotify has just added a “very high” quality streaming option to its iPhone app as of version 0.4.23 which streams music at 320kbps over WiFi or 3G. Choose this setting if you consider yourself to be an Audiophile. The sound quality is noticeably cleaner in this setting, especially if you have your iPhone connected to quality speakers while streaming Spotify. You are now also given the option to resync your offline tracks in this high quality. If you enable this high-fidelity feature make sure you understand the bandwidth implications over 3G to avoid being put into a throttling bucket by your carrier. Low Bandwidth: 128kb/s which is great for when you are low on bandwidth. Search – You can search for anything including song title, album title, artist and Spotify quickly shows you the results. Results are shown divided into 3 tabs: Tracks, Albums, & Artists so you can easily find the most popular song by an artist or drill into their albums one by one. Currently there is no suggested search as you type feature in the Spotify iPhone app unfortunately but Spotify will try to recommend a correct spelling after you’ve performed a search if need be. Playlists – There is no “radio feature” in the Spotify iPhone app for now which may be an issue for some people, especially those using Rdio or MOG. There is also no “history” feature in the Spotify app. Spotify revolves around playlists. In Spotify you add tracks one by one to playlists and play those playlists on your iPhone. There is also the concept of “Starred” tracks which is its own specific playlist. Strange as it sounds, the Playlist idea actually works pretty well. Obviously your playlists are synced across computers and devices so lists you create at home can be accessed on the road and vice versa. 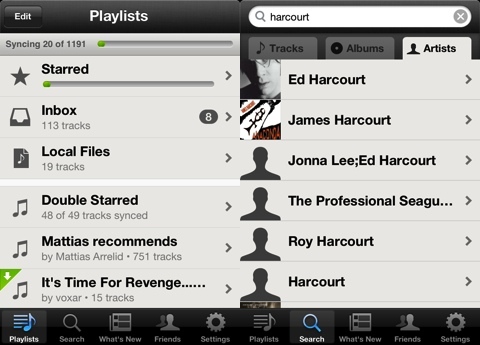 There is no option of searching for playlists created by other users on the iPhone for now which would be nice. The iPhone app gives you a pretty simple interface for both editing and creating playlists. Now Playing – The Now Playing window in the Spotify iPhone app is very clean & useful. Album art is shown and below that you see a simple control bar on the bottom for next, previous and pause/play and a track seek-bar. Tap anywhere on the screen to hide/show an interactive extended info overlay including Volume control, Shuffle/Repeat, AirPlay output, Artist, Album and more. From here you can drill into the Artist page, Album page, Add the song to a playlist or Star it, and Share it on your social networks. Background Music Playback – Spotify can play music in the background on your iPhone using the multitasking feature in iOS. You can also see the album cover for the currently playing song on your iPhone while on the lock screen. From the lock screen you can also control playback using native iPod controls. 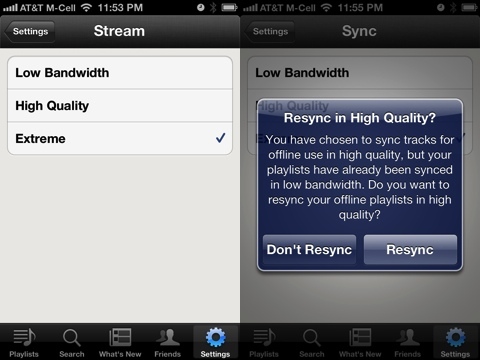 Offline – You can make any playlist available to playback offline in the Spotify iPhone app. Friends & Social – Spotify uses Facebook to add a social angle to music discovery. It can show your friends what you are listening to by posting to your wall. Within the iPhone app you can view playlists and starred songs made public by your Facebook friends who are Spotify members. These settings can be turned off or made private if you don’t want to partake in the social aspects of Spotify. Spotify also has built in support for last.fm scrobbling. For even more social indulgence, make any of your playlists in Spotify “collaborative” amongst your friends. New Music – In the What’s New section you’ll see a weekly updated list of 10 newly released albums, and the top 10 tracks for your country. The Spotify app does not offer anything in the area of browsing popular music charts or even artists by genres as of now. Issues and Missing Features – I’m sure you’ve all had a weird moment when your iPhone has gone off or started playing some song by accident. Well, sometimes when you open up the Spotify app, it automatically starts to play the last song you were listening to, which can be both annoying and embarrassing. There should probably be an option in the app’s settings for this type of “feature” if it is done by design, or fixed if it is a bug. Other issues revolve around the lack of features such as: random radio playlists made popular by Pandora, search as you type, and options for discovering music using various charts. The Spotify desktop app has done a great job of providing pluggable 3rd party “apps” which leverage the Spotify API. It would be nice to have those Spotify apps in the iPhone app. If you want the radio functionality, a third party app called SpotON was released which does a pretty good job. While the app is minimal and is missing these features, overall it works pretty fast and is quite stable. You can try the Spotify service via this app for free for 48 hours if you’re new to Spotify. And you can get a 30 day trial if you enter your email address and sign up for the demo. You will need to become a paying “Premium” Spotify member to continue to use the iPhone app. As of now Spotify is available in these countries: USA, Finland, Denmark, Germany, France, Portugal, Norway, Netherlands, Spain, Sweden, and United Kingdom. Australia & Ireland are coming up next! Sometime this month Spotify will announce its launch in Australia and and expansion into Ireland. Aussie fans who already have options of using Deezer, Rdio on the iPhone, will be glad to know Spotify will also be available soon. Spotify for iPad is finally here! You can download the app as a universal binary so it works on both the iPad, iPod touch and iPhone with a single download. 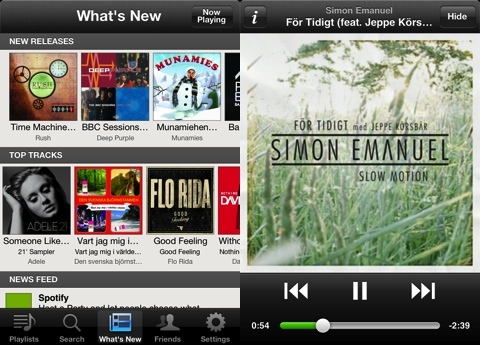 Not having an iPad app was a major issue for Spotify and was sorely missed, until now. AppSafari review of Spotify iPhone app was written by Joe Seifi on February 11th, 2012 and categorized under App Store, Europe, Free, Fun, Music, Radio, UK. Page viewed 11853 times, 3 so far today. Need help on using these apps? Please read the Help Page. Desperately Waiting Spotify on iphone …. Oh, wow, this seems to be really neat. Definitely going on my “to download” list. For those who haven’t downloaded it already, check out Freephoo a free app that lets you use your iPad like a phone. I’ve been using it for a while and it’s really very good. Another 3Party app, Spotilicious, generates playlists based on genres like in the Spotify desktop client. It has around 1000 different genres to choose from! !